Geeni Prisma 450 Smart Color LED Bulb Review | Nerd Much? Illuminating your home with colorful lighting, as opposed to the typical soft white or yellow bulbs of the past, has become more and more common. Now, homeowners are not only looking to save a buck by using efficient bulbs, but also add a bit of dynamic lighting and color to their home decor. We’ve seen many different products in the past that have done this, including Philips Hue and LIFX, and the Geeni Prisma 450 Smart Color LED bulbs are another option. Geeni Bulbs allow you to control your lights using your smartphone from anywhere, and like LIFX’s 75W equivalent bulbs, they don’t require a hub. Instead, each bulb has Wi-Fi built-in. To control the bulb, you’ll use the Geeni app, free on Google Play and the iOS store. 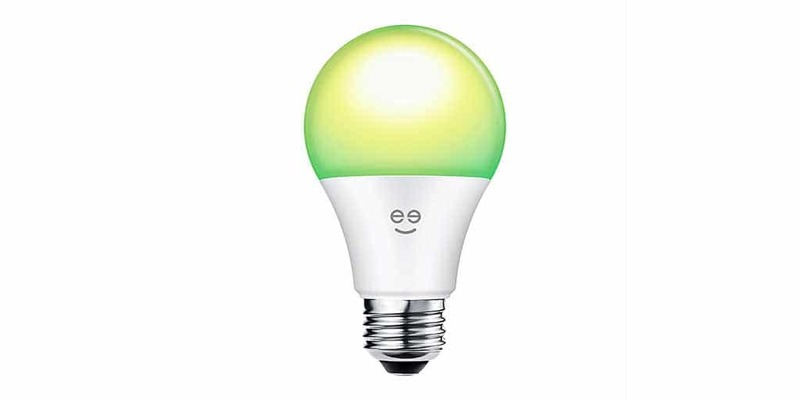 The bulbs also work with your Echo via Alexa, as well as Google Home via Google Assistant. The bulbs are a 45-Watt equivalent, presenting 450 lumens, and you’re able to select any color via a color palette wheel right in the app. You’re also able to use preset scenes, like Rainbow, Party, or Reading, each of which has their own color, brightness, and color changing setting. Setup is incredibly easy, as you just download the app, screw in the light bulb, and then connect the light bulb to your device through the app. As far as functionality is concerned, it’s pretty close to its closest competitor, the LIFX bulbs we’ve reviewed here previously. There’s only one major gripe when comparing the two, and that’s that the Geeni Prisma 450s aren’t nearly as bright as what LIFX offers. However, the Prismas come in at just $24.99, which is half of the MSRP of LIFX’s A19 bulbs. And, that’s where Geeni’s Prismas start to get interesting, especially to those who are looking to bring smart functionality to their home’s light bulbs without breaking the bank. It’s the fact that they’re half the price of other brands on the market, yet are still functional enough to make the purchase worth it. A lot of the functionalities we praised with the LIFX bulbs are still relevant here — including ease of setup and synergy between our Amazon Echo. And, generally speaking, Prismas are just a less expensive version that’s too similar to not compare, making it a great option when looking to light it up. **I should also note that Geeni also offers a 75W version of their Prisma bulbs that would be an exact match to the LIFX’s brightness, and it still comes in at a price less than the competition. However, we haven’t tested those yet.